Specials good 12/21-12/26/2015 or while supplies last! 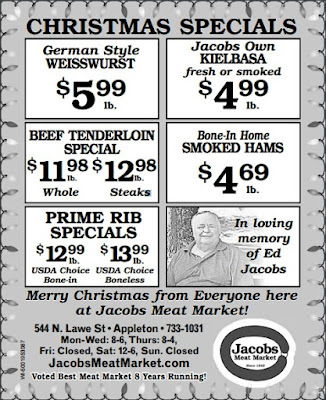 Well, it is with a heavy heart that I have to tell you, the week of Christmas, that the second-generation owner of Jacobs Meat Market, my father, has passed away! He passed away on Saturday night with his family by his side! He ran the store for over 40 years before retiring in 2007. He will be sorely missed by a LOT of customers that he had a great time over the counter with, the staff that knew him well, and me, his biggest fan! For those of you who knew him, you know how much he loved to tell a joke and "spread the Bologna" and know how he had a knack for telling a story that you just weren't sure if you could believe or not. :) I wonder where I get that from?!?! He was an honest, hard-working man who I looked up to for many years! His legend lives on in the store with every questionable story and with all of his recipes that he has developed! Thank you for your kind support and kind words to those who have shown your sympathy already! I know you understand his legacy and respected him a lot as I do! I hope you have a the Merriest of Christmases and I hope you appreciate your families!